"How deep they lay, these second persons, and how little one knew about them, except to guard them fiercely." Published by Houghton Mifflin Co. on October 2, 1915. 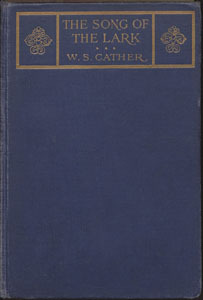 Published by John Murray in March 1916. Published by Houghton Mifflin Co. in 1937. Published by Cassell and Company in 1938. Published by University of Nebraska Press in 2012. Historical Essay and Explanatory Notes by Ann Moseley. Textual Essay and Editing by Kari A. Ronning.